This card is later than I would like, but at last I got my Christmas card for the month done. I did not use any particular sketch, but used a layout I just love. I reminds me of a comfy family room. 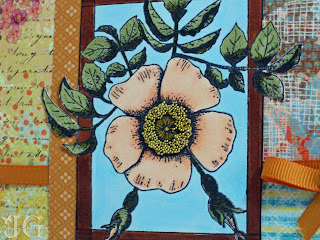 I should note that this card is also designed with the Roses on Paper Challenge #12 - One For The Boys. 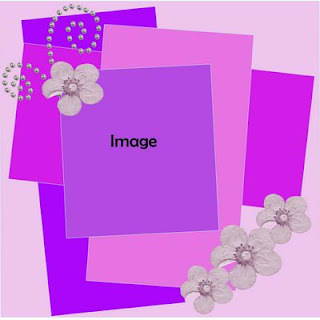 The idea is to design a card oriented toward men with no frills, flowers, ribbon, lace, etc... Though this is a Christmas card, it was designed with the guys in mine. I purposely left off the flowers and lace. 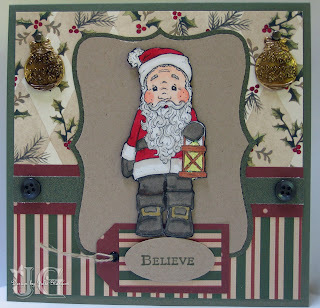 Stamps: Santa With Lantern (Magnolia), Believe from Anna Griffin stamps. 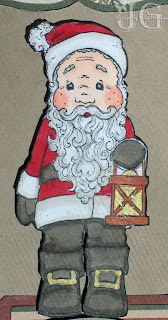 I used my gold paint pen to color the buckles on Santa's boots. I used the Stickles to add some shimmer to the lantern. I should also note that I used gold ornament charms. I just felt like the gold was a little to shiny, so I dulled it to match the buckles with my W7 Copic and heat set it. I decorated the inside to match the cover of the card. When I am ready to send it, I will add a sentiment. 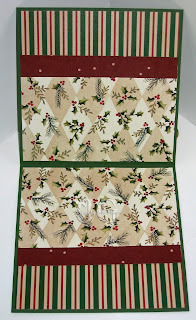 Sorry I am late, but hopefully this will inspire you to work on your Christmas cards while there is still time to spare. Things have been a bit crazy lately. We are continuing to update our house, so the weekends have been filled with pulling down wallpaper and painting. However, the house is shaping up nicely. 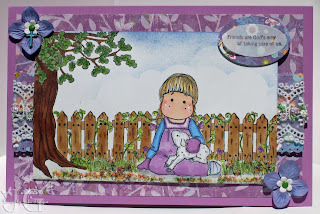 Today, I am posting the card that I made for the Friday Sketchers Challenge and also for the Simon Says Challenge, which is Animals. I flipped the sketch around accidentally, but it still works. I used paper from DCWV that had big blocks with bones, fire hydrants, etc. I cut the bone out for Tilda to sit on. I used E08 and E09 for the red colors on Tilda's outfit. I had a cute little button in my stash that is a dog bone. I thought that was perfect for this card. I am late on my Christmas card that I hoped to post Monday, but I am still working on it. So, check back tomorrow and hopefully it will be done. 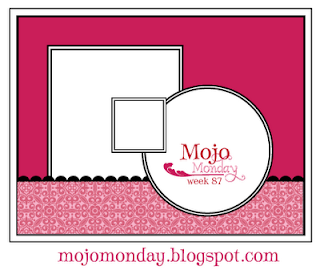 I totally planned to participate in the Blogger's Challenge last week, but ran out of time. 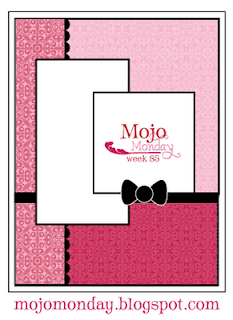 However, I got it together this week, and have a card to post. The challenge for this week was "Patriotic." 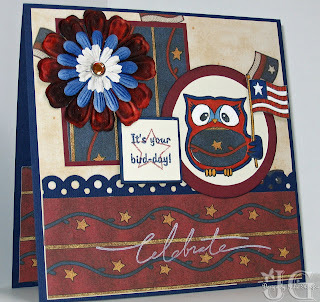 I have a friend whose birthday is really close to July 4th, so I used the patriotic theme to make her a birthday card. Other notes: I added the designer paper to he belly of the owl. This flower was tricky. I wanted the colors to match, and did not have the right color flowers. However, I have a paint can of white flowers. So I used my Copic Airbrush to color the flowers. It worked beautifully for the blue flower, but the red flower was just too orange and bright. I really wanted to add Bravo Burgundy, but nothing seemed to work. I used my color spritzer, and it just added dots. I tried using wax paper with burgundy and a water spritzer, but could not get even color and it soaked the flower. 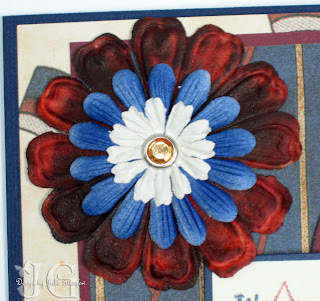 I used my heat gun to dry, and then applied the flower directly to my burgundy pad. It was then too dark. So, I spritzed the flower with water and dried it again with my heat gun. The picture below is the result. I actually like the way it turned out. 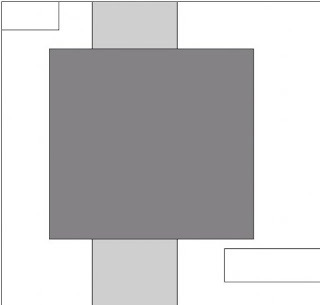 It has some depth and dimension. 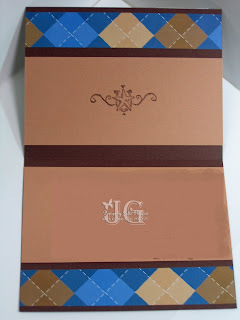 It kind of blends with the designer paper. I hope you have a safe and wonderful Memorial Day Weekend! I used stick-on gems for the flourish in the top left corner. I also used some gems for the center of the flowers to carry on the theme. I distressed the edge of the white cardstock the Tilda is sitting in and used Cameo Corral and Regal Rose direct to paper to color the distressed edge. I also added ink to the edges of the designer papers to add some dimension. 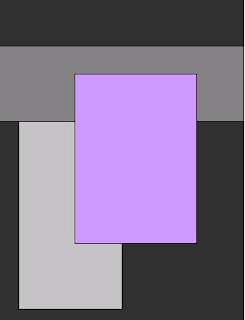 These are the colors I used to color Tilda. You may notice that I used C1. I actually used it quite a bit to dull down the really bright pinks and greens. I works really nice to blend the colors and tone them down. 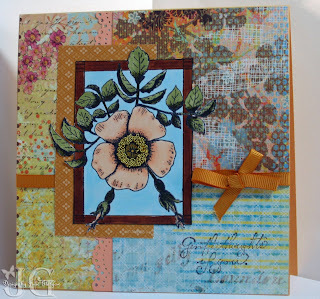 See you Friday for the Blogger's Challenge. 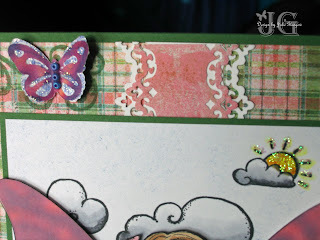 3 Clovers Thursday Challenge - A card for a woman and use ribbon or lace. 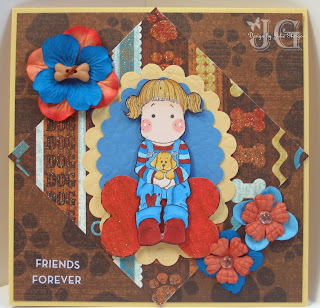 I added a nice generic sentiment to the card - "Friends are God's way of taking care of us." 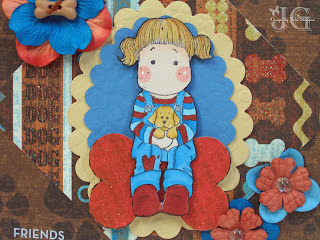 This was for the Cute Card Thursday Happy Mail Challenge. This is a card I can send to a friend to brighten their day. 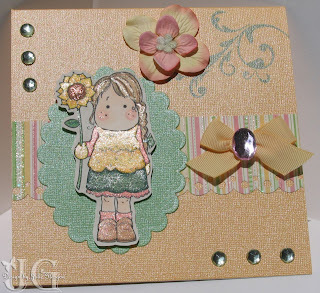 Spoon Full of Sugar - Touchy Feely - The Flower Soft gives a nice texture to the card. 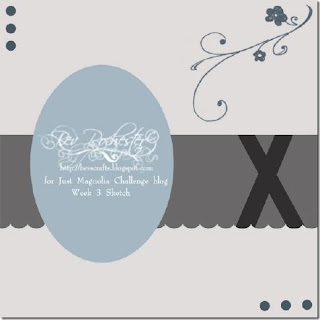 3 Clovers Thursday Challenge - Card for a woman and add lace or ribbon. 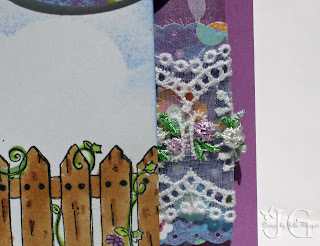 I added this lace with slots to weave in ribbon to soften the bold background paper. I wove in this pretty flower embroidery trim. 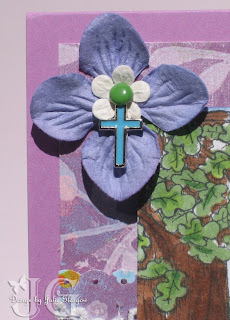 I wanted to add this cute cross charm that I found at Walmart to continue the Christian theme of this card. I hope you all have a wonderful Mother's Day. Have a wonderful week! 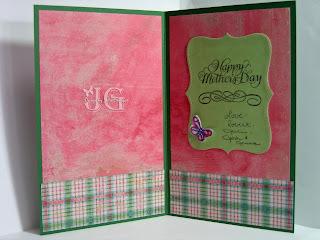 The Blogger's Challenge for this week is Mother's Day. 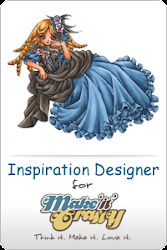 I should also note that this is another submission for the Magnolia-licious Make Your Own Tilda Butterfly challenge. Here is the Mother's Day card I sent to my mom. 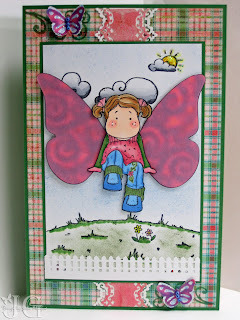 Other notes: I cut out the wings with the Beautiful Butterflies die cut in both the Paper Pizazz and the pink vellum. 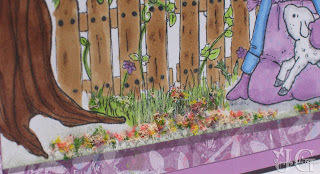 I then used my Xyron to attach the vellum to the background paper to give it a softer look. I like how this normally sitting Tilda seems to be skipping to take flight as a butterfly. 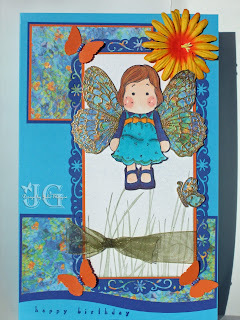 I used Stickles on the butterflies to make them pop. I used beads to create the body. I also used Stickles on the sun to make it shine. 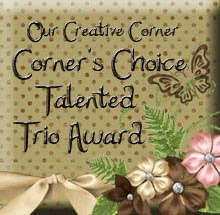 I carried over the papers to the inside of the card and used the Top Note die for my message. 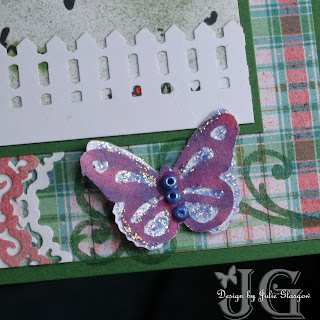 I added a little butterfly on the inside of the card as well. To all you moms out there, I wish you a very Happy Mother's Day! I hope you have a beautiful weekend! Paper: K & Co, So Saffron DSP. Embellishments Mustard grosgrain ribbon, gold micro beads. I had this thing about using this K & Co paper that I got while on vacation last month. It is very collage oriented and sort of old world. It is really fun paper. This challenge was great for this paper. 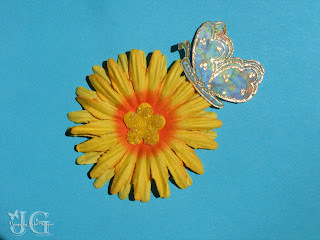 I used gold micro beads to embellish the center of the flower. 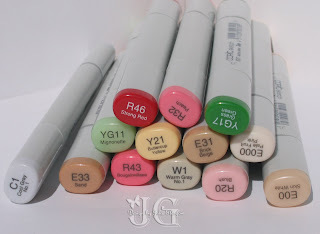 I colored with Copics. I like how the simple image plays off the busy paper. 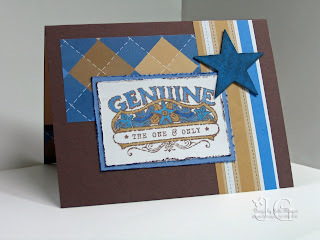 Paper: Tempting Turquoise, Brilliant Blue, Pumpkin Pie, Paper Pizazz Bright Great Backgrounds. 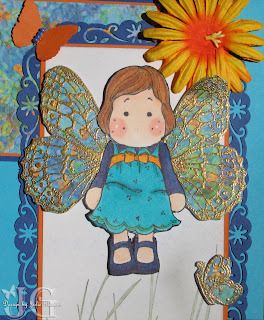 Embellishments: Prima’s, gold embossing powder, artichoke organza ribbon, beads, Fiskars border punch, Martha Stewart butterfly punch. This card is actually designed for another challenge proposed by Magnoli-licious. The challenge was to create your own butterfly Tilda. 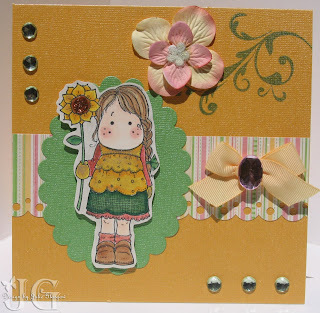 I used a retired stamp from Stampin' Up! called Stipple Butterfly for the wings. 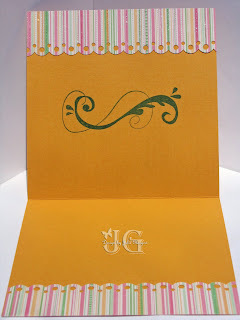 I stamped it on a piece of Bold Bright Backgrounds paper with Versamark and embossed with gold embossing powder to try to achieve a faux cloisonne look. 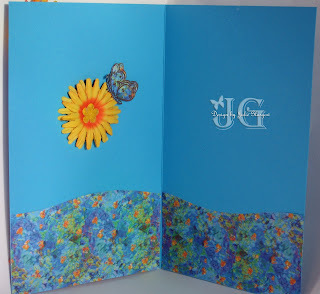 I used the same paper for the background paper and the other embossed butterflies. I was trying to make it look like Tilda is flying. I hope the effect came across. I followed the wave theme from the front of the card into the inside of the card. 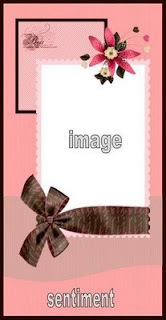 The inside of the card is decorated with Prima's. 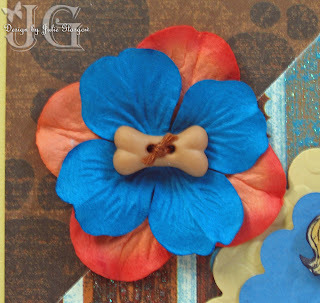 The center flower was covered with glue and micro beads. 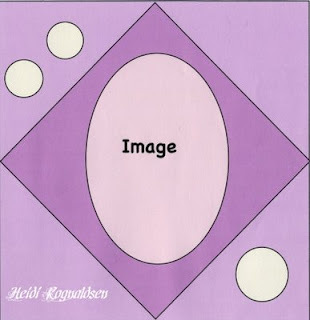 Check back Friday for my Blogger's Challenge card. I posted several pictures because I wanted to try to show off the shimmer of this card. The Bazzill paper just shines in the sun as do the Blingz and Shimmerz. I should also note that this card is my Mother's Day card for my MIL. Therefore, I am also posting this for the Magnolia Down Under challenge which is to make a Mother's Day card. 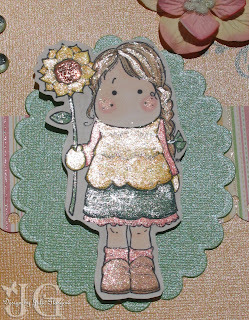 I colored Tilda and the Sunflower with Copics, and then went over the top with Blingz and Shimmerz. I added copper Stickles to the center of the sunflower. 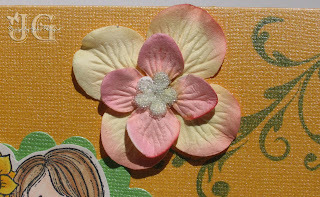 The flower is Prima's hydrangias and is finished off with a little "Got Flowers" flower with micro beads glued on. The inside of the card is decorated very simply. I am not sure if I will use this as a Mother's Day or Birthday card. 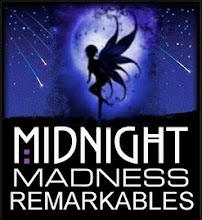 Oops, I am late with my Friday Blogger's Challenge. I do have a good excuse. My daughter's birthday was Friday as well as her ice skating Spring Show. Friday, I hit the ground running and did not stop until midnight. We had four 12-year-old girls for the night. Woohoo! I turned the sketch on its side to work with the stamp I chose to use. I wanted to make a card that was easy to mail as this card is for my nephew, and his birthday is tomorrow. I really need to get it in the mail ASAP. Therefore, I did not use lots of thick or heavy embellishments. I think this is pretty good for a 14-year-old boy, don't you? Nice and masculine, not too youthful.